Hurricane Emily was a very strong July hurricane in the 2005 Atlantic hurricane season. In fact, Emily is the only known category 5 hurricane in the month of July. Emily also broke the record for the strongest hurricane, just days after Hurricane Dennis had done so. Hurricane Emily was also one of four category 5 hurricane in the 2005 Atlantic hurricane season. Hurricane Emily affected many countries, this includes: the countries in the Windward Islands, Jamaica, Honduras, Cayman Islands, Mexico (twice), and Texas a state in the United States. The hurricane caused about $988 million in damage and killed 15 people. Even though all of this happened, the name Emily was not retired, so it was used again in 2011. On July 10, Tropical Depression Six started. Late the next day the depression became a tropical storm, it got the name Emily, making it Tropical Storm Emily. The storm headed west toward the Windward Islands. Tropical Storm Emily slowly and then quickly got stronger. 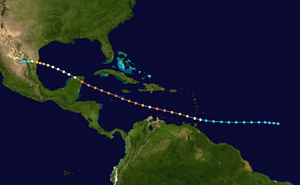 Emily became a hurricane, shortly before striking Grenada on July 14 with winds at 90 mph. After Emily left the island, it got stronger, which caused it to became a category 2, and a category 3 not long later. Over the next day, Hurricane Emily got stronger and weaker. On July 16, Hurricane Emily reached its highest strength, becoming a category 5 for a short moment and getting winds at 160 mph. After this, Emily weakened just a little, keeping it at a strong category 4. 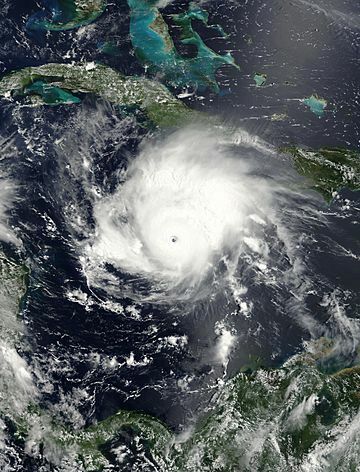 Hurricane Emily made landfall in Cozumel and the Yucatan Peninsula on July 18, while still a category 4. The hurricane weakened a lot over the Yucatan Peninsula, going back into the Gulf of Mexico while barely a category 1. It slowly got stronger as it crossed the Gulf of Mexico. The hurricane did not really get any stronger until it was about half way to its next landfall. Hurricane Emily made its final landfall in Tamaulipas, Mexico as a category 3, on July 20. The hurricane died the next day over Mexico. Hurricane Emily caused a lot of damage, nearly $1 billion worth, and about 15 people got killed. Most of this happened in Mexico, because it got struck twice by Emily. Damage in Mexico was near $632 million. While just over $178 million in damage happened in Texas. Even though all of this happened, the name Emily did not get retired in the spring of 2006. So, the name Emily was used again in 2011. Emily is the fourth category 5 hurricane not to get its name retired. Hurricane Emily (2005) Facts for Kids. Kiddle Encyclopedia.